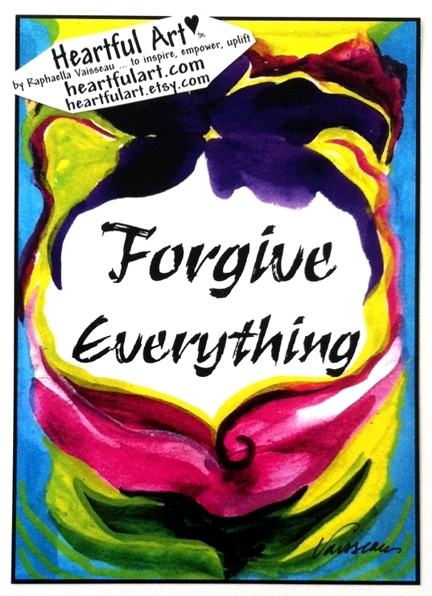 Poster or print of "Forgive everything" with art by Raphaella Vaisseau. Simple wisdom, powerful concept, this magnet reminds us simply to forgive. Forgive everything. Forgive yourself, forgive others, God, circumstances, everything. The benefits are taught in churches, hospitals, and books. Forgiveness. Secret of living a life of freedom. Forgive. Give the benefit of the doubt. Nurture acceptance. Breathe in, breathe out.